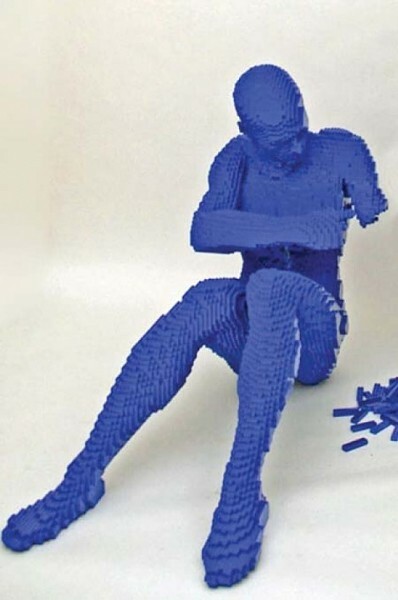 Nathan Sawaya preferred sculpture medium is Legos. Part of Sawaya’s trick of using the plastic brick is just to “go big.” Most of his figures—whether it’s the reclining blue figure deftly completing its own arm (pictured), or the yellow figure opening its gaping chest to spill out more of its own bulding blocks—are life-size. Many of the other pieces, such as his mosaic portraiture, are in fact even larger than life. He even has a constructed cardboard Monopoly game practically the size of a small retaining wall. But what is important to Sawaya is the fact that by using such a whimsical toy, both children and adults alike relate easily to his rather detailed sculpture. To him, it is a way of getting children to start thinking creatively, artistically and aesthetically. This Saturday, there will even be a hands-on event with the community Lego sculpture building contest.